There’s a lot of 3D-printed guns news going about today. Part of the surge in 3D-printed guns news has to do with the amount of people that are downloading blueprints for the firearms. Reports claim that there are thousands of people that have been downloading the designs to make their own firearms at home. 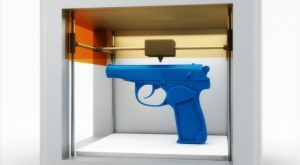 These blueprints for 3D-printed guns weren’t suppose to go up yet, but were posted online early. The restriction on sharing the media online has to do with a recent ruling about the designs. This ruling came from the US Justice Department and found sharing the designs online to be legal. Despite this, the 3D-printed guns news is taking off as President Donald Trump comments on the matter. The President says he is “looking into 3-D Plastic Guns being sold to the public.” According to President Trump, it doesn’t “seem to make much sense,” reports BBC News. This isn’t the only bit of 3D-printed guns news that is making the rounds today. There are also several states that are suing the Trump Administration to block the sharing of the blueprints. The lawsuit comes from Washington Attorney General Bob Ferguson and several other attorney generals are joining in. The following are the states that are suing the Trump Administration over its ruling on 3D-printed guns. The District of Columbia is also joining in on the lawsuit. To top off the 3D-printed guns news, some attorneys generals in 21 states are requesting Secretary of State Mike Pompeo and Attorney General Jeff Sessions exit the deal that allows the blueprints to show up online, Time notes. Article printed from InvestorPlace Media, https://investorplace.com/2018/07/3-d-printed-guns-news/.